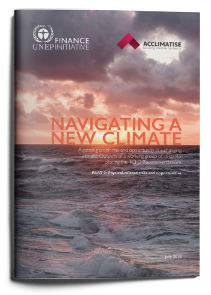 This report is the result of a collaboration between sixteen of the world’s leading banks with UN Environment Finance Initiative (UNEP FI), and climate risk and adaptation advisory firm Acclimatise. The banks set out to develop and test a widely applicable scenario-based approach for estimating the impact of climate change on their corporate lending portfolios as recommended by the Recommendations of the Financial Stability Board’s Task Force on Climate-related Financial Disclosures (TCFD). This report focuses on the physical-related risk and opportunities, which is the risk resulting from climate variability, extreme events and longer-term shifts in climate patterns, and constitutes the second in a two-part series publishing both the physical risk and transition risk assessment methodologies developed through the Working Group’s collaboration. The first report in the series ‘Extending our horizons: Assessing credit risk and opportunity in a changing climate: Outputs of a working group of 16 banks piloting the TCFD Recommendations’ was published in April 2018 and is available for download here. Find out more about the TCFD Pilot Project for banks here. Download Korean version of the report here.